Michael Gove has made a shock return to Government as Theresa May carried out a reshuffle of her Cabinet following the General Election humiliation. Downing Street said he had been appointed Environment Secretary replacing Andrea Leadsom who becomes the new Leader of the Commons. The former justice secretary was sacked by Mrs May in one of her first acts as Prime Minister after he effectively scuppered the Tory leadership hopes of Boris Johnson - his fellow Vote Leave campaigner - by withdrawing his support and announcing his own candidacy. The PM has sought to bolster her position following last week’s disastrous showing at the General Election, effectively making one of her closest Cabinet allies Damian Green deputy prime minister, while keeping Jeremy Hunt in his role despite having become a hate figure for many in the NHS. Mr Green, who was the work and pensions secretary, becomes First Secretary of State - a title held by William Hague under David Cameron - as well as Minister for the Cabinet Office. In other moves David Gauke - who was the Treasury chief secretary and has long been regarded as one of the Government’s strongest performers - is promoted to take over at the Department for Work and Pensions. David Lidington, the leader of the Commons, also gets a step up as the new Lord Chancellor and Justice Secretary. He replaces Liz Truss who becomes Treasury Chief Secretary “attending Cabinet”, in a move that will be seen as a demotion. There had been speculation she could be axed altogether following fierce criticism from the judiciary over her failure to speak out in support of judges who were criticised over the Article 50 High Court ruling. 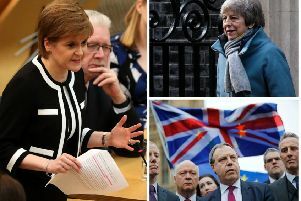 The decision to keep her in the Government will be seen as an indication of Mrs May’s weakness following the loss of her Commons majority in the General Election. The Prime Minister had already announced that her five most senior ministers - including Chancellor Philip Hammond and Foreign Secretary Boris Johnson - were carrying on in their current positions. Mr Hammond in particular had been widely tipped for the chop in a post-election reshuffle and the announcement that he was carrying on at the Treasury underlined her limited room for manoeuvre. A number of other ministers were confirmed in their existing positions including International Trade Secretary Liam Fox, Education Secretary Justine Greening, Communities Secretary Sajid Javid, Business Secretary Greg Clark and Welsh Secretary Alan Cairns. Ms Greening, who stays at Education despite differences with Mrs May over the Prime Minister’s flagship programme for more grammar schools in England, told reporters she was “very happy” to be carrying on as she left No 10.